20120115 - All up and out to church. Home for lunch and D's friends over for a school project. In the afternoon we loaded up and headed North, with a quick trip to the Home Depot to check out toilets. 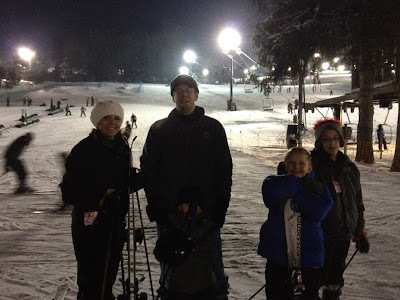 We ended up at Snow trails in Mansfield for some skiing. Gma&paW came out to watch as LJ&G learned how to ski. D did really good and J&G got the hang of it right after I took away their poles. L: well let's just say she tried... Everyone had a good time and after 4 hours of cold and trips down the hill we headed home with some TIRED boys and a bruised mom. What a BLAST! 20120107 + Jacks were WILD!